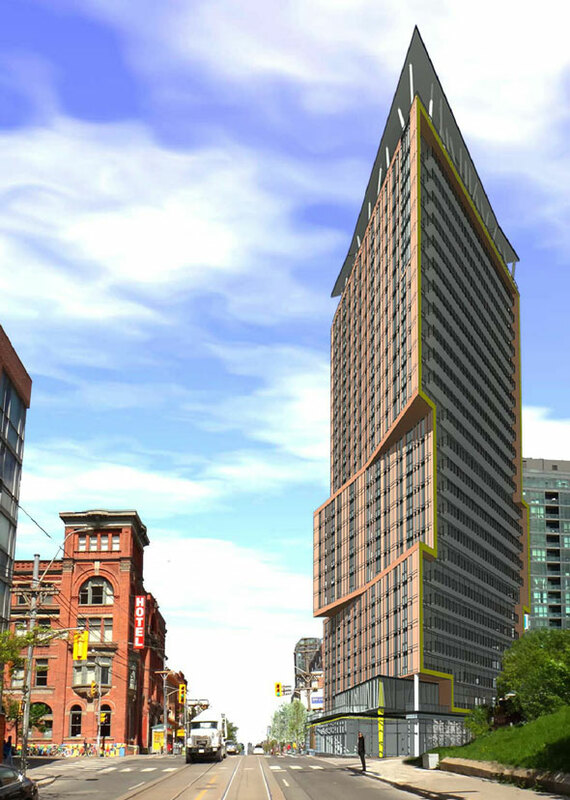 A whopping 26-storey proposed condominium at Queen and Gladstone looks destined to get the chop at next month's Toronto and East York Community Council meeting. 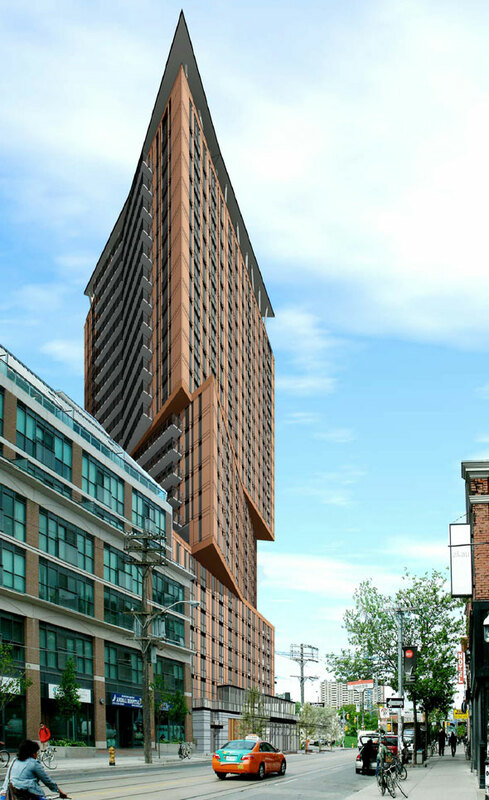 Planning staff say the 90-metre wedge-shaped tower would be an "over-development" of the site, which is directly opposite the Gladstone Hotel. "The height and scale of the building are not appropriate for the site," a city staff report says. "The density is too high, the relationship to the Gladstone Hotel is not appropriate." It reminds local councillors who will vote whether to toss the proposal out next month that the all of the development in the surrounding area is mid-rise. The official local height limit is 16 metres. And you thought the Bohemian Embassy was a shock to the neighbourhood. The proposed density of the tower would be 10 times the area of the lot, much higher than any of the buildings approved in the vicinity. The height would also cast unacceptably large shadows on the neighbourhood. In spring, the building would block light as far east as Lisgar Street. An eight-storey building was proposed for the same site in 2007. The planning application was appealed at the Ontario Municipal Board and eventually withdrawn in 2013. The site was sold to the current owners - "YOLO INC" (yeah, really) - shortly after and plans for an even taller 28-storey tower were presented at a public meeting last summer. Reading through the report, there isn't much city staff like about this proposal at all. It's too tall, has too many units (but not enough with 3-bedrooms,) not enough parking or amenity space, and the unusual angular shape does not step back from the street as required. In short, this one's destined for the scrap heap unless it gets a total overhaul.